Attn: XPS 8700 Owners - Upgrade!! I am an owner of a brand new Dell XPS 8700 with an i7 4970 CPU. Out of the box this computer is pretty darn quick but I wanted just a bit more in a smaller form factor. I have a GTX 980 and an i7 4790k CPU from another machine and wanted to see if this machine would support the upgrade without gutting it. I also took a stab at adding an ASETEK 545LC (92mm) cooler to the mix to keep things in check. I searched high and low on the interwebs and didnt get much in returns of success. So for those of you looking to squeeze a bit more out of your machines without upgrading PSU, motherboard...then I hope this helps. -Replaced 92mm chassis fan with CoolerMaster 92mm 4-pin PWM fan. - Stress testing CPU returns temp of 68C. -CPU pump runs off the 3pin chassis fan header and the rear fan is driven from the 4pin CPU fan. 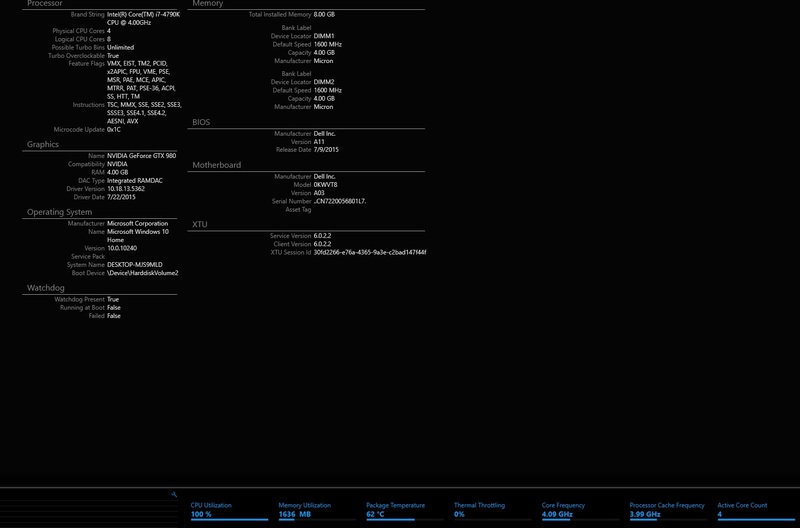 -Upon putting the 4790k in, BIOS (A11) now has a similar OC feature like alienware OC lvl 1, OC lvl2. Photos below. Feel free to msg me with questions. RE: Attn: XPS 8700 Owners - Upgrade!! It is good to know the 4790K works. I think the OEM Dell PSU is going to die if you push that GTX 980 very hard. I'd also watch the case temps with the cover on. But, you probably have the fastest XPS 8700 around. Yes, I agree. Down the road I do plan on a better PSU. -Prime95 crushes the CPU a bit more than XTU - hitting mid 70s with temp. I suspect the 92mm fan just doesnt have the volume to do better (its also rather hot in the room). Would love to adjust RPM/Temp for CPU. -Next it appears there are provisions to add another 92mm in the front of the case. There are 2 screw holes along with 2 standoffs. I havent put a fan up to it next but im sure thats what it is. There are no additional fan headers on the mobo so you would need to power from SATA. I will tear it back down tomorrow and give it a shot. Checkout the XPS 8700 / GTX upgrade thread. Some have commented that adding fans hasn't helped and have instead gone with a case swap. On this system I removed the HDD cage and moved the HDD to the drive 2 bay. This alone gives better air flow into the case. If you add a front case fan you might also consider removing the PCI card spacers on the back of the case to improve the flow of hot air out of the system. Can you post a screenshot of CPU-Z when under load showing the CPU voltage? I'm mostly curious how much the OEM board can deliver. The link above is my non-dell 4790K. and then used the stock fan in the front of another 8700 system. I used a Y-connector and a fan extension so it runs off the same fan header as the exhaust fan. This system has a GTX 770 that is overclocked and it runs rather warm. Hoping the second fan will help. If this doesn't help, a larger effort is to cut away the front of the case and add a 140mm fan but I'm not really looking forward to doing that. Stress test using intel's XTU. In regards to the PSU - I have a Season Platinum 660w coming. While the machine runs, I dont trust the PSU under heavy loads. One thing that you may have to watch out for are temps on the mSATA SSD, mine shipped with none at all, so figured I'd use the slot. Installed the Crucial M550 256GB version & from Day One, the temps of that SSD exceeded all components of my PC, ranging from 50C to as high as 70C (Samsung owners has reported the same). I felt that to be kind of odd, being that it was directly under my MSI branded GTX 960, which runs at 30-34C, even with a couple of browsers with a dozen or so pages each open, and the MB was normal at 28-32C, the CPU at 32-40C (used to be 28-32C, must be time for re-pasting). At any rate, there was nothing transferring heat to the drive to make it run hotter than the rest in my PC. A couple of months later, to save the mSATA SSD from what would surely be an early death from heat by first installing it in a SYBA mSATA to SATA-3 converter & I placed it far away from those other components, no difference. Finally, what saved the day & made the mSATA SSD run at temps in line with the rest in the XPS 8700, was a low cost Rosewill 2.5' adapter that came with a small fan, only a SATA to Molex power adapter was needed, once I added that & had the fan blowing direct on the mSATA SSD, temps are finally in line with the rest of the system. 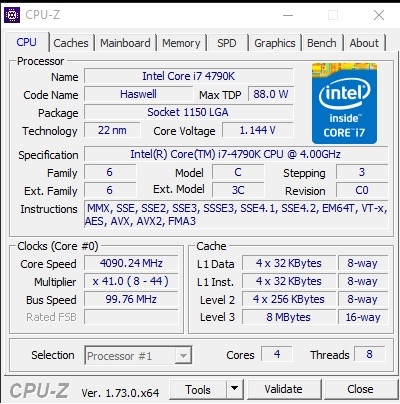 Glad to hear that the i7-4790K is working for you, though it should have ran fine anyway, just some said that the native Turbo Boost to 4.4GHz wasn't working. If the A11 BIOS update fixed this, that's enough reason alone to update it, though I believe the real reason was for Windows 10 support. Still it's good to get to get any added benefit. My initial plans was to get this CPU months ago, but kept being told 'no it won't work', so having a i7-4770 that hardly breaks a sweat, and as another helpful member on this site advised me, that's a huge upgrade for so little gain. The CPU I have goes up to 3.9Ghz if needed, spending $300 (on promo) for 0.6GHz more doesn't really appeal to me any longer. The other upgrade I wanted, to have one of the Intel PCIe x4 SSD's, was shot from the sky when I found out what appears to be a x4 slot isn't one at all, plus one needs a Z97 MB to run it, and yet to this day, Dell & other OEM's are still shipping Z87 based PC's. I presume, to clear the warehouse of stockpiled components. I've came to the conclusion that in reality, there's no more room for speeding up the XPS 8700 based on the fact that I have a Z87 MB, and that SATA-3 SSD speeds will be the bottleneck for any upgrade that I perform. No add-on card is going to change that, it's further hampered by having only one graphics slot, which prevents me from pairing a couple of future GTX 960 Ti variants that will likely have a 192 bit bus option at a minimum. While the XPS 8700 has been the best PC that I've owned, with an i7, 12GB RAM, 1GB GDDR5 GPU (the latter two has been upgraded, in addition to 3 SSD's) for all intents & purposes, it's maxed out. Moving to another case won't do anything other than allow me to upgrade the PSU to add a single GTX 970/980 (& BTW, watch that PSU, I've see YouTube vids of a 970 install, but not a 980). I'm not spending $500 (minimum) to upgrade a GPU when the one I have meets my needs, have DX12 with Windows 10 Pro. My next PC will be self built & not with a 4 core CPU, rather one of the 6 core Intel offerings, I don't need built in graphics, for less than $50 more than the price of the i7-4790K, can have one of Intel's 6 core offerings, though I'd want to go a bit higher. Hope that you enjoy the i7-4790K & GTX 980! I think the sweet spot for the 8700 is when running a GTX 970 or less, and IF-AND-ONLY-IF you can snag an xps 8700 i7/8GB for close to $600 with a core i7. The build system is one I just built and the prices I paid over the last 45 days since I started collecting things. The Upgrade assumes the same prices and $699 sale price for an 8700 that I haven't seen in the past few months. Faster CPU, Overclock-Able CPU. 16GB of very fast RAM (CL7) MASSIVE CPU cooler,, M2 SSD slot, PCI express support, very quiet case that can hold lots of fans with simple 5/7/12V controller. No Wifi, No Bluetooth, No Keyboard, No Mouse, Case is 2-3 inches taller, 2 inches wider and a few inches deeper. Time to buy all the pieces, time to build. Easy. Can be upgraded in about an hour. Stuff pretty much just works. easily. I'm not going to rail on the 8700. It is a good pre-built with limitations of a small case, locked processor and limited fans. 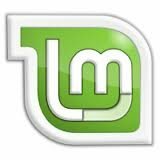 If you have one to upgrade it is a good platform. If you are going to build one from the ground up, and want more, then the cost is not much more if you price shop. "The Upgrade assumes the same prices and $699 sale price for an 8700 that I haven't seen in the past few months." Dan-H. that's exactly what I paid for mine at Costco, and it shipped with an i7 & 12GB of RAM. The catch was that it had Windows 8. They had the same model, only with 8GB RAM instead of 12GB, and Windows 7 for $100 more ($799.99). Anything with Windows 7 did & still does cost more than 8.1 & 10 today, though the only offerings now are the Pro version. That's what Costco was pushing when I got mine, 7 Pro. Two whole pallets of Toshiba notebooks with i7's were gone inside of 30 minutes, some getting their limit of 5. Costco was bringing out two pallets every hour to ensure there was stock for the sale period. They did the same with Dell Inspirions with dual core i7's a month later. Since I had a full version copy of Windows 7 sealed, I figured to just setup a dual boot, have 4GB more RAM & have both OS's for $100 less than the cost of the Windows 7 model. I had already checked, the drivers were there, didn't care for the few extra software offerings, which to be honest, Dell didn't load this PC with a load of garbage. Though 3rd string retailers like Best Buy likely did load them up with garbage. They were selling the XPS 8700's with i5's for more than Costco was charging for i7 versions. At the time, I was saving for a build, a i5 one, and when I laid eyes on the XPS 8700 at Costco, knew beyond a shadow of a doubt that I couldn't build an i5 system for that price, let alone an i7. Quality components costs hard cash, and on the Dell site, the exact same configuration that I got was $350 more at $1,049.99. So being a Costco member has it's perks, great prices on decent computers. In fact, they still carry the XPS 8700, though now, most comes with 32GB RAM, 2TB HDD & 4GB DDR3 GPU (seems like Dell is no longer pushing GDDR5 equipped models). One thing for sure, Dell has squeezed all it could from the sales of the XPS 8700, for over 2 years straight. I have no idea what's going to replace it, yet I hope that like notebooks, desktop PC's doesn't become watered down with dual core CPU's (they've since went back to quad core, but with only 15W). 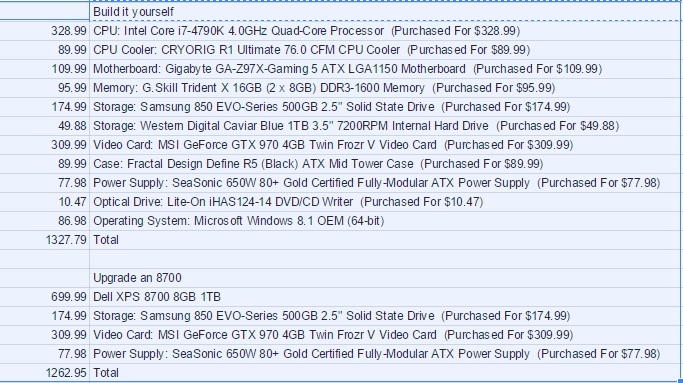 Fore $699.99, I'm not complaining a bit except on one spec of the PC. What appears to be a x4 slot on the bottom, is a x1 one. What are we supposed to install in such a slot? A SATA-3 card to add more SSD's (or storage HDD) or an eSATA card? That's all it appears to be good for. Many purchased a Kingston branded x4 SSD, only to find out the speed wasn't there, or the cards couldn't be booted from & are now unloading these on eBay. Like I did, they should have searched the Dell forum before purchase. I didn't even have to ask, seen a Topic in regards to that port.